After my experiment modeling chocolate, I was anxious to try my hand at Gum Paste. I bought a small pouch of Wilton gum paste and played with it. This particular gum paste is very sticky-- I don't know yet if all gum paste is like this. It's also bright white, so I felt like if I had so much as a tiny particle of dust on my hands it would get stuck in the gum paste. I wish I had better photo documentation of the making of the stiletto, but this cake was made when this blog was a mere figment of my imagination. Thus, I promise more process pictures in future posts. Anyway, I made the stiletto in basically 3 parts, though I think there ended up being 4 pieces. The sole: I started by rolling out a piece of gumpaste (carefully) on my Sil-pat using some shortening on my hands/ rolling pin to prevent sticking. I free handed the shape of the sole, and cut it out using one of the gum paste tools in my kit. I did this by looking at a real shoe to make sure I got the right shape. Gum paste is interesting in that when it's soft, it can't support weight, but as it hardens, it holds its shape. I rigged up a drying rack for the sole using parchment and a book under the heel, and some masking tape to hold the right angle of the parchment (I used a C++ book to show that I am, in fact, using my engineering degrees.) While the sole was drying, I started the heel. The heel: I rolled a gum paste log and stuck a cut-off bamboo skewer in the middle for structural integrity (see! more engineering). I thought I would just 'flare out' the top to make it match the width of the sole, but it didn't quite work out seamlessly. Gum paste seams are hard to hide... fyi. And it can crack. Anyway, I made the shape as best I could, and then constructed another disc to bridge the gap between the heel and the back of the sole. I also added a little heel pad for realism. Once the heel was done, I did my best to balance the sole on the heel so that I knew the resulting heights and dimensions would mesh. The toe strap: I cut the toe strap out of rolled out gum paste as well. Again, I freehanded, primarily. Obviously, I had to ensure that the toe strap was longer than the width of the sole so that it would have some height. I made an initial guess at the shape, then laid it in place with cotton under it so it wouldn't sag. Then I could trim it down to fit flush. I think I used a little canned buttercream to make the two pieces stick together (though ideally I would use royal icing.) It might be possible to use glucose or tylose... I will have to look into it further. But note that you can't just stick two pieces of gum paste together once it's started to dry out. I let the assembled shoe dry completely. Then, the pieces that weren't securely fastened, I re-secured with buttercream or royal icing. Then I set to painting. For the heel, I tried painting with gels, but the coloration wasn't right. So I ended up coloring some buttercream and basically painting with that. I could fill in some gaps, but it was hard to make it look completely smooth. I still need to find better mediums to 'paint' with on sugar products. Painting with the black gel paste worked great, as you can tell by the sole and the heel pad. For the toe strap, I used diluted gel colors, then painted on the leopard print with black gel paste. The shoe was done before I started the rest of the cake. For the cake, I used a boxed yellow cake mix (I had already used every bowl in my kitchen to make the buttercream). I did add a touch of love to the mix by separating out some of the batter and adding some dark hershey's syrup. Then I marbled the chocolate batter with the yellow cake, so it looked snazzy. For the buttercream, I used a recipe that called for some cream cheese, though I didn't really taste it all that much. I filled the cake with white buttercream, then colored some purple for the outside of the cake. For the piping, I used one batch of royal icing dyed 3 different colors. On the top I did the lettering, and embellished it a little with some dots. Finally, I added the little flowers. Again, all of this was done with the parchment cones. And when I was done, I could just throw out the cones! Good thing, because my kitchen was already a nightmare of dirty bowls by the time I was done. I'm now a blog follower and can't wait to see how your work progresses! Good luck! 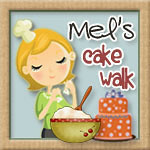 I'm actually starting Wilton Cake 1 next week, and I have Cake 2 scheduled for next month. I'm very excited. There's a Cake Art Party Store not too far from where I live in Atlanta that offers a pretty wide variety of classes. I have to stop myself from signing up for all them all at once!